It is upon us once again. The Super Bowl for film nerds. The final Shoot Out for all industry insiders. We have finally reached the end of another Awards season, with the Academy Awards now only a week away. Sure, the Hollywood community has been handing out acclaims and numerous statuettes for a month or so, but for some, the only thing that matters in the end is getting that little golden man named Oscar. It’s amazing how this one award, out of all the others, has become the pinnacle prize for all things cinema. I think that it’s mostly due to the legacy behind it. The history of the Academy Awards is just as fascinating as anything else that has come from Hollywood. All the careers that have been given a boost; all the backstabbing that happens behind the scenes in order to beat out the competition; and also all the “what were they thinking” winners that we’ve seen throughout the years. 2013’s Oscar nominees are interesting, because of how varied they are. It’s been a while since I’ve seen a year where the race for the top award has been this wide open, which is a good thing, because the more suspenseful the race, the more interesting it becomes. For this article, I thought I would go through all the nominees in the top categories and share with you who I think will win, and who I think should win, and also share some of my general thoughts overall on these races. Being a writer, this and the following category are the ones that I take particular interest in, as well give a particular scrutiny towards. What I find very weird with this year is that the choices for this and the other writing category highlight the strange standards that the Oscars use for considering a screenplay original or adapted. In this category, we have two films that are based off of true life events (American Hustle and Dallas Buyers Club), and yet they’re considered original enough to be included in this category. That may make the creators of the other movies upset, because their films come from completely original ideas. I do, however, like the line-up here, and one of those questionable inclusions is indeed my own personal pick. Bob Nelson’s Nebraska script is clever and witty, but maybe a little too low key compared to the rest. Woody Allen already has won several times, so I think his Blue Jasmine script will also not be honored. Dallas Buyers Club is a movie more notable for it’s performances than it’s writing, so I think the Academy will pass on it too. Now, between American Hustle and Her, I definitely choose the one that I got more entertainment value out of, which would be American Hustle. That being said, I believe the Academy will actually honor originality this year, so that means Spike Jonze will win. This category also has the same questionable standards that it’s sister category has. Before Midnight is considered an adapted screenplay, even though it’s not based off any source material and is merely a sequel to two other movies. The Wolf of Wall Street also is very loosely translated from the memoir of it’s main subject, Jordan Belfort, so you could make the argument that it’s more of an original piece of work than an adapted one. But, despite the standards that the Academy used to make their selections, we do have a set of some very interesting choices in this category. First of all, Before Midnight is merely nominated as an acknowledgement to a critically acclaimed movie, so it has no chance of winning. Captain Phillips is more of a directorial achievement than a writing one, and I actually found the script to that movie as it’s weakest element. Comedian Steve Coogan showed he had a talent for writing drama with Philomena, but it’s also out of the running. So it comes down to Wolf and 12 Years. My own choice would be Wolf of Wall Street, again just because of the entertainment value. But, I think the Academy was more impressed with the gritty realism of 12 Years a Slave, and I wouldn’t blame them for choosing that one either. Some people complain about scripts that go for the heart rather than the mind, but 12 Years managed to do both perfectly. The supporting actors category is probably the one that turned the most heads this year with some of it’s selections. This years nominees includes a first time actor (Barkhad Abdi) two actors known more for their comedic work receiving nods for the second time (Bradley Cooper and Jonah Hill), as well as an actor who hasn’t made a movie in over six years (Jared Leto). Also, I feel that some even better performances got shut out of this category for reasons unknown (Daniel Bruhl for Rush and Colin Farrell for Saving Mr. Banks). But, even still, everyone nominated still did fine work here. Looking them over, you would think that the more traditional choice of Michael Fassbender for 12 Years a Slave would be the favorite. But ever since the nominations were announced, it has been Jared Leto who has emerged as the clear favorite. And it’s a position that I can’t argue with. Leto clearly put the most effort into his role, loosing a ton of weight in order to play the AIDS-stricken, transgender hustler Rayon in Dallas Buyers Club. But the reason why it’s the standout among the others is because Leto also gave the character personality and charisma, which helps to back up the physical transformation that he made for the character. That’s why he is the undisputed favorite in this category, and probably the safest bet at this year’s Oscars. Let me get this out of the way first: NOT JENNIFER LAWRENCE. Don’t get wrong, I enjoyed her work in American Hustle. I even thought it was better than her Oscar-winning performance in Silver Linings Playbook. But, when compared to the other performances in this category, I think it’s really unfair to call her the odds-on favorite to win. Jennifer Lawrence is definitely the girl of the moment, but I don’t think celebrity power alone should guarantee you an award. Thankfully, it seems like that sentiment has taken hold in the last few weeks, and Jennifer Lawrence’s “sure thing” is now looking like a much tighter race than before. Lupita Nyong’o’s heartbreaking performance in 12 Years a Slave is gaining a lot of traction, and she has a SAG award win to back that up. Hopefully it’s enough to put her over the edge on Oscar night. And although a win for Nyong’o would make me happy, I do have to say that I’m pulling for an upset for Nebraska‘s June Squibb. 84-year old June Squibb gave one of my favorite performances of the year, and was definitely the highlight of Alexander Payne’s film. The Academy likes to honor old-timers from time to time, and while I think it’s a long shot, I would love it if they honored Ms. Squibb for her delightful work in that film. This is one of the year’s most competitive races. In any other year, each one of these performances who be a clear favorite, so the fact they all have to compete with one another shows just how hard a choice this category will be for most voters. One thing that they all can take pride in is that they beat out Tom Hanks for a nomination, in one of Mr. Hanks’ better years. One thing the nominees I’m sure are also pleased with is that they have legendary actor Bruce Dern within their midst. Dern’s performance is touching and note-perfect in Nebraska, but unfortunately, I don’t think this will be a year where the academy honors someone for their whole body of work on top of their performance in a particular film (i.e. Henry Fonda in 1981’s On Golden Pond). No, this year it comes down to three standout performances from Matthew McConaughey, Leonardo DiCaprio, and Chiwetel Ejiofor. Ejiofor is unforgettable in 12 Years a Slave, and would be deserving of the award, but I think he lacks the star power to put himself over the top. McConaughey and DiCaprio have much more goodwill built up in their favor, and I think McConaughey has the edge, considering the career-changing year he’s had. My personal pick however would have to go to DiCaprio for Wolf Of Wall Street. His performance in that movie was easily my favorite of the year, and the one that I think showed the most range out of everyone in this category. It’s a clear choice for me, but a difficult one to predict this year. And hey, if McConaughey doesn’t win Best Actor for Dallas Buyers Club, he’s pretty much guaranteed an Emmy for his work on HBO’s True Detective this fall. Very much the opposite of the Best Actor race, this category has a definite front runner. Cate Blanchett has enjoyed a considerable lead in the last few months, having won every award up to this point. And indeed, I don’t see her coming away a loser in this category at all. But, did she indeed give the best performance out of all those nominated in this category. While I have to say that I did enjoy her work in the film, I wouldn’t consider Cate Blanchett to be my own choice for Best Actress. In truth, I actually like two other performances more than hers. One was the incredibly dynamic performance put in by Amy Adams in American Hustle, who managed to shine the brightest in a movie full of Oscar-nominated performers. The other is the very underrated work by Sandra Bullock in Gravity; you have to respect an actress who can carry a movie all on her own like she did, especially when it’s as complex as Gravity was. If I were to pick one over the other, I would choose Amy Adams. She’s one of the best and most versatile actors working today, and I think it is only fitting that she should be honored for her most dynamic role to date. However, despite my hopes for an upset, it seems like nothing will stand in Cate Blanchett’s way towards a Best Actress win; not to say that she’s undeserving. On a side note, I like Meryl Streep, but really Academy? Do you have to nominate her for everything, even when the movie isn’t good? I would rather see Emma Thompson sitting in her place right now at this year’s Oscars. The directing categories often coincide with which ever movie wins Best Picture, but not always. Last year’s winner, Ang Lee, won for Life of Pi out of luck due to the fact that his toughest competition was not even given a nomination (Ben Affleck for Argo). This year, there were no obvious snubs, so it makes the race a far more competitive category this time around. Alexander Payne is the least likely to win due to his film being the most low-key, and Scorsese has already claimed this prize once before. Russell has been on a roll lately with Hustle, as well as nods for Silver Linings Playbook (2012) and The Fighter (2010), but I think he still hasn’t found the traction needed to put himself over the top yet. Instead, the two front-runners are directors who both would make history with a win. If Alfonso Cuaron wins for Gravity, it’ll make him the first Latino director to win the Award. If Steve McQueen succeeds for 12 Years a Slave, he would be the first Black director to win. Both men are very deserving of the honor, but if I were to guess a winner, it would be Cuaron. 12 Years a Slave is an impressive piece of work, but it also is very traditionally made as well. Gravity on the other hand pushes the limits of film-making in all sorts of ways, and clearly shows the more impressive directorial effort. Steve McQueen showed an impressive effort with only the third film he has ever directed, and hopefully someday he will win the award outright, but this year you just can’t ignore Alfonso Cuaron’s more groundbreaking work. Finally we come to the big award of the night; the one that the studios waste big money on every year. Having seen all 9 nominees, I am happy to see that six of them were on my end of the year Top Ten. While many of them are very deserving of the nomination, it is clear that some of them have a better chance than others. As I see it now, it has become a race between two heavy hitters, with maybe one or two underdogs that could potentially upset. The leading candidates are Gravity and 12 Years a Slave right now, and honestly at this point, I have no idea who will win. This is made even more complicated by the fact that one of the bell-weather awards this season, the Producers Guild Awards, ended in a tie for the first time in it’s history. This has led some to believe that the Oscar race could very well end up in a tie as well, which is a strong possibility. If I had to make a choice, I would have to go with Gravity. It was my favorite movie of 2013, and the last time my top movie for the year won Best Picture was in 2006, with Socrsese’s The Departed. It wouldn’t bother me if 12 Years a Slave won the award, and an upset made by American Hustle or Wolf of Wall Street would be welcome as well. But, I think Gravity is the movie of the year and should be honored as such. Still, a little part of me does want to see that tie happen. It may throw off a lot of office Oscar polls, but it would be historic nonetheless. 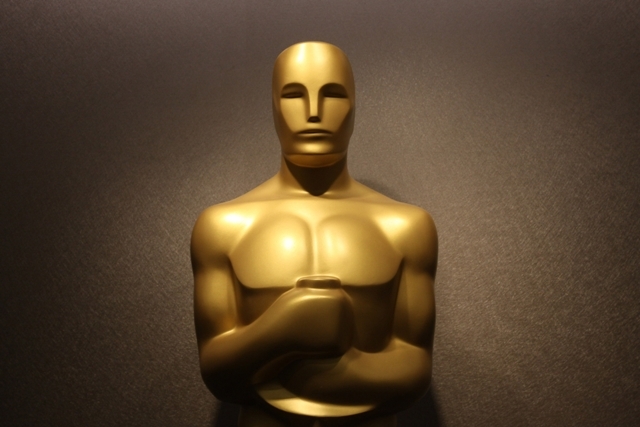 So, these are my choices for the winners of the 2014 Academy Awards. I know I probably won’t be 100% right, since this is one of the more unpredictable races in recent memory. But, I will say that for most of the nominees this year, the honors have been well deserved. Thankfully, I managed to catch most of the top nominated movies this year, so that I’m able to make educated assessments of each award. Some of the other categories like Best Documentary Best Animated Film were ones I couldn’t make predictions on because I haven’t seen all the nominees just yet. I did manage to watch the Short films nominated for this year (my picks are Feral for Animated and Just Before Losing Everything for Live Action, in case you’re wondering). Overall, regardless of whoever wins, what I do enjoy most about these awards is the legacy that it leaves behind year after year. Every year, we see new names added to the ranks of Oscar winners, and it’s an exclusive club that anyone in the film industry would do anything to be a part of; and have. Likewise, an Oscar-winning film carries that distinction far beyond the Awards themselves, and seeing them all together we more clearly understand the sometimes turbulent but nevertheless fascinating history of cinema. In any case, my hope is that the March 2nd ceremony proves to be an enjoyable one overall. With Valentine’s Day just around the corner, we commonly see Hollywood try to capitalize on the romantic mood of this time of year. Of all the genres in film-making, the one that seems to have stayed strong year after year is the Romance genre, which benefits from a very specific audience that usually makes up a good percentage of the film-going public; that being people looking for something to watch on a date. But, what I find interesting about this year is that there has been a significant reduction in the number of romantic movies in theaters. In fact, this Valentine’s Day has only one wide release that you could consider a traditional romantic movie; the Colin Ferrell-headlined Winter’s Tale, which has to compete in it’s opening weekend with Robocop. How’s that for date night counter-programming. The foreseeable future also looks absent for the romantic genre, with not a single wide release film until April 25’s The Other Woman, and that one might be considered more of a slapstick comedy. I don’t know if this is just a fluke in the schedule, or a sign that the romantic genre has suffered a backlash, due to a recent string of notable failures. I can see how the latter could be true. Some truly horrendous movies have come from the genre recently, and I see it as a result of the genre’s current troubles with tone, character development, and just overall lack of definition. I should state that I have a little bias when it comes to talking about genre pictures like romantic movies. Romance is a genre that I generally don’t understand and usually try to avoid, not because of themes or content, but because I rarely get any entertainment value out of seeing characters fall in love throughout an entire movie. I do, however, acknowledge that there are films that do work well in the genre and can be quite uplifting as well. I just gravitate more towards action oriented genres, although romantic subplots are indeed found in the movies I watch as well. Some romantic plots in action movies can even more memorable than the ones that come from the romance genre itself. What I mean to say is that I do like a good love story, it just all depends on the movie. But, when a movie is clearly boxed in by the genre restraints put on it, I inevitably end up judging a book by it’s cover and in most cases, I’ll probably end up right. Romantic films, probably more than any other genre, suffers from too little diversification. There is a specific audience that goes to these types of movies, and the studios make every effort they can to meet those expectations. But the fact is, there are fewer fresh ideas coming out of this genre and the studios are beginning to scrape the bottom of the barrel just so they can have anything that will draw the audience it wants. I think one of these problems can be attributed to an issue that in fact is affecting all aspects of film-making; and that’s the overabundance of movies. Now, it might be unusual to think that more movies out there is a bad thing, but it’s an issue that actually is causing a decrease in the quality of films out there overall. Steven Spielberg and George Lucas’ now famous op-ed from last year stressed that the studio system was going to implode on itself because of the out-of-control ways that movies are funded and distributed, and that’s something that the romance genre clearly suffers from. 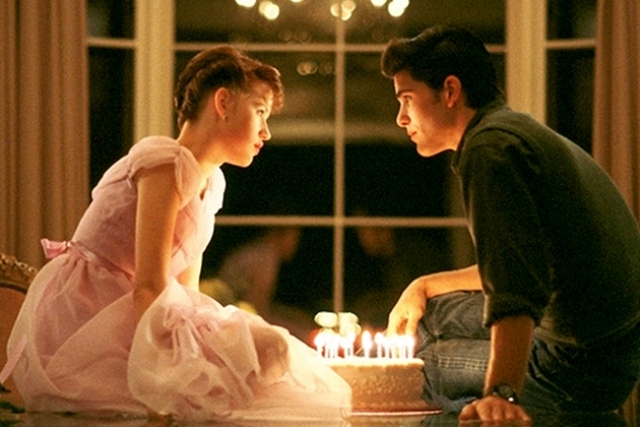 Originally, there would be one standout romantic film released in every quarter of the year, which would do very well. 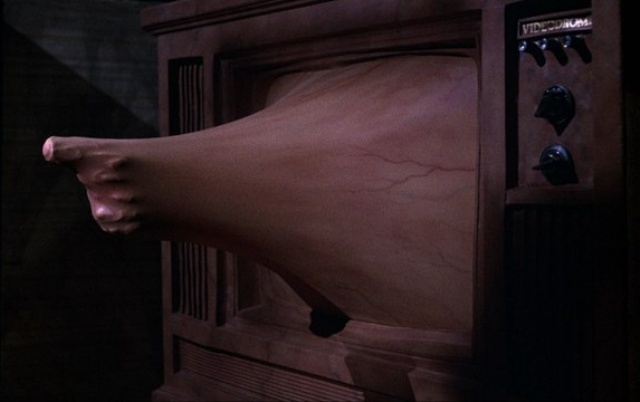 But, because of the increased flow of production, we have seen multiple genre movies all released at the same time. This time of year has typically belonged to the romance genre, with movies like Safe Haven (2012) and Beautiful Creatures (2012) battling it out in the same weekend. But, what usually has been constructive competition has ended up making it rough road for the romance genre, with very few entries actually gaining a foot hold at the box-office. And when studios absolutely must have 5 or 6 new genre movies season, it means that less care is going to be given to the choices of stories given the green-light. But what I think has happened to the romance genre is that it has become complacent. Like I mentioned before, the genre is valuing quantity over quality, and that is leading to more movies that are exactly the same. The strongest culprit of this would be the dreaded “Wedding” picture. If the Romantic genre were like a sinking ship, “wedding” movies would be the anchor dragging it to the bottom. In the last couple years, we have seen movies like Licence to Wed (2007), Made of Honor (2008), Bride Wars (2009), The Proposal (2009), and last year’s The Big Wedding all make it to the big screen and predictably get trashed by critics. I think this is primarily because this sub-genre is characterized more than any other by it’s own cliches. Pretty much every movie I mentioned can be summed up with the same story-line. Girl wants to get married, problems ensue, girl ends up with the guy she really wants, the end. The less interesting the plot, the less people are going to like it, and this sub-genre has become something of a joke over the last few years because of movies like these. Bride Wars in particular turned out to be so insultingly bad, and probably the least progressively feminist movie ever, that even fans of the genre had to cry fowl. It seems like filmmakers feel that just the sight of wedding traditions is entertainment enough, which is entirely the wrong way to look at your audience. The reason why Bridesmaids (2011) became so popular was because it subverted this despised genre in hilarious ways, and that’s ultimately what people wanted in the end. But is the genre completely helpless and without quality entertainment. Not at all. Usually all it takes is for one inspired idea, or a filmmaker who gives a damn like Nora Ephron or John Hughes, for a romantic film to work. Last year, we saw two examples of quality movies from the genre, made by people who have already left their mark with these kinds of films before. One was from Richard Linklater, which was Before Midnight, starring Ethan Hawke and Julie Delpy. Midnight is the continuation of a series of movies following the same couple as they reach different stages in their lives, which started with 1995’s Before Sunrise and continued with 2004’s Before Sunset. These movies are almost universally beloved and respected and it shows that if the people involved are invested enough in what they are making, it can end up being a quality film. Another movie that actually left a good mark on the genre last year was the film About Time, which illustrated how you could make a charming romance work by injecting a new idea into it. The movie was written by Richard Curtis, who has become synonymous with the Romance genre over the years with his scripts for beloved movies like Love Actually (2003), Notting Hill (1999) and Four Weddings and a Funeral (1994). What Curtis did with this film to make it stand out, however, was to include a supernatural element; in this case, time travel. While not entirely a novel idea, he nevertheless made it work with the film’s themes of awkward romances and regret, which in turn made it a more enriching film overall. Having a unique voice helps to make a Romantic movie work nowadays, and it certainly is a breath of fresh air when a good one comes along. The reason why many of the best ones hold up is because they treat their characters with dignity. One of the biggest mistakes a person can make when writing a love story is to value one character’s worth over the other. This sometimes gets into the tricky issue of gender politics, which can be a minefield if handled improperly. Oftentimes, when a person writes a very poor love story, it’s because the male and female characters are played as generic stereotypes. How believable is it when you see a movie where a girl has a hard time finding an attractive man, even when she has no flaws herself? Hollywood has a problem with portraying body image correctly in movies, largely because they put glamour before everything else. Would Bridget Jones’ Diary (2001) have been better if a fuller figure actress had played the main character, instead of the more petite Renee Zellweger? I honestly think Hollywood should give something like that a shot. Also, as a male, I feel like men are underdeveloped in these movies. Either they are just the object of desire, or a sexist jerk who doesn’t understand the main girl’s feelings, and that’s it. Sometimes it’s the girl who also gets the short end of the stick in this genre, by being too self involved in their own feelings, thereby being less interesting. Overall, the best love stories are the ones where the characteristics of both individuals are given enough time to develop, because in the end, love is a two way road. So, is Hollywood seeing a backlash from a long string of terrible genre picks. It might be too early to tell. One thing that I think may have happened is that the genre has evolved into something else that can’t be clearly defined by the genre norms that we’re all familiar with. For one thing, the rise of Young Adult novel adaptations has changed the way we look at romantic plot-lines in movies. With films like Twilight bringing romance into the supernatural realm, it’s safe to say that you can make any type of genre flick into a popular romance. Hell, last year we even got a zombie love story with the movie Warm Bodies. The reason this trend seems to be happening is because the audiences that would have normally gone to the movies as part of a date night are now seeing movies of all kinds, not just Romantic movies. In many ways, Hollywood has actually done a fairly good job of making movies that appeal to both genders, like The Hunger Games series. That seems to be why the traditional romantic movie seems to have disappeared recently. Oh, it’s still there, only not as prevalent as it once was, and that might be to it’s advantage. Less competition can help a genre film stand out and maybe even get a boost from a more discerning audience. There will always be an audience out there that wants a good, old-fashioned love story and this is the perfect time of year to not only indulge in the same old thing, but to also fondly remember the ones that really touched all of our hearts. One thing that we really gravitate towards in our culture are larger to life heroes. There’s just something about extraordinary people righting problems in the world through extraordinary means that we find so appealing. Or maybe its the idea that all of us may have some untapped power within us that can someday be useful. Having super powers are an interesting concept that has come out of literature and cinema over the years, but not every great hero is defined by this. Sometimes just pure talent can make a hero appealing. And likewise, how we use theses talents that are given to us is also what separate us from being either the good guy or the bad guy. While heroes have been around throughout the whole of our literary history, the idea of dissecting what makes a hero who they are is a far more modern concept. Today, it is no longer the larger than life aspects that we find interesting in our heroes, but rather the things that ultimately make them human. Comic books have done a great job of defining the ideals of a super hero, but to see where these concepts of modern day heroics have came from, you only need to look back at what is probably the first modern super hero: Sherlock Holmes. Created by Sir Arthur Conan Doyle in the late 19th century, Sherlock Holmes was a character unlike any seen before in literature. He was an eccentric yet extremely intelligent private detective who could solve crimes in ways that most other people couldn’t. The brilliance of Doyle’s creation was that Sherlock’s unconventionality enabled him to observe the world in ways that conventional Victorian society wouldn’t have understood and find the answer in places no one would’ve expected. Not surprisingly, Sherlock Holmes was an enormously popular character in his time and has continued to stay strong in our culture over a hundred years later. Not only that, he has inspired other super detectives throughout the years like James Bond and Batman, who in various degrees are the Sherlock Holmes of their times. Hollywood has likewise seen the value in this character and have adapted Arthur Conan Doyle’s classic stories again and again for the big screen. Thankfully, Sir Arthur wrote numerous novels as well as countless short stories with the character, which has given filmmakers plenty of material to draw from. I’ve looked at a few of these different adaptations and it’s interesting to see how the character has evolved with the times and yet has still retained his popularity. So, let’s take a look at the evolution of Sherlock Holmes on film. Though there were many films based off of Arthur Conan Doyle’s books during the silent era of film-making (some even written for the screen by Doyle himself), it wouldn’t be until Hollywood jumped in when Sherlock Holmes became a box office success. Produced by 20th Century Fox, the Sherlock Holmes series turned into a profitable franchise that also turned it’s lead, Basil Rathbone, into an A-list movie star. Though he had been around as a contract player at Fox for many years before, Rathbone’s career would be redefined by Holmes. 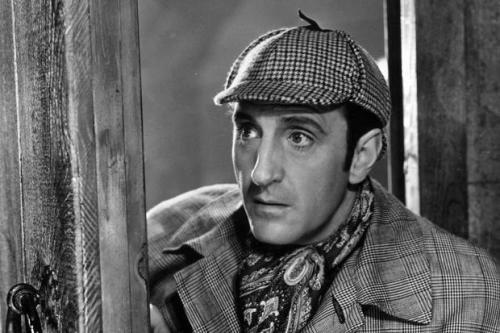 Rathbone could not have been more perfect for the character; perfectly capturing the English-ness of Sherlock Holmes, while still making him appealing for American audiences. Likewise, for Sherlock to work as a character, he needed to have the support of a strong supporting cast, particularly when it comes to Sherlock’s trusty companion, Dr. Watson. Here, Watson is played by British actor Nigel Bruce, and while Bruce’s performance is perfectly fine, there is something lacking in the translation of the character. In these film, Watson is just there to stand by, amazed at Holmes genius, which isn’t entirely true to the original character, who was more helpful in the books. But when it came to Sherlock himself, Hollywood couldn’t have done any better. Rathbone would go on to make 15 movie in the series, and would be the standard on which all other adaptations would be judged by in the years to come. Despite the enormous popularity of the Fox/ Rathbone Sherlock films, there weren’t many other film adaptations of the famed detective, until this British production. The Private Life of Sherlock Holmes is fascinating more for it’s production than as an actual film, considering all the problems that happened behind the scenes. The film was made by the legendary Billy Wilder, who was a big fan of the Holmes novels and he wanted to give his best shot at the material in a lavishly detailed production. The film unfortunately went over-budget and over-schedule quickly, and the reported original director’s cut of 3 1/2 hours was sliced down to a little over 2 hours by the studio, making the final film feel disjointed and incomplete. The cast is serviceable enough, but not particularly memorable. British actor Robert Stephens definitely looks the part, but he lacks the charm that Basil Rathbone brought to the role. Watson comes off a bit better, though. Played by actor Colin Blakely Watson is more like the diligent partner from the books here than the befuddled companion that Nigel Bruce had played. Also noteworthy in this adaptation is the presence of Sherlock’s meddlesome brother, here played by legendary actor Christopher Lee. Though not a terrible film by any means, it unfortunately doesn’t work as an adaptation of the classic novels, and seems to be an odd fit for director Wilder, the man who gave us the likes of Sunset Boulevard (1950) and Some Like it Hot (1959). 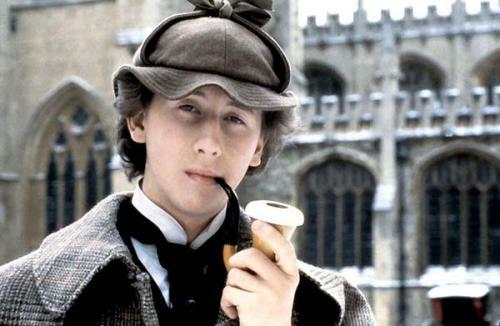 Speaking of people named Wilder, actor and writer Gene Wilder took his own stab at making a Sherlock Holmes film. Though, unlike previous efforts, this was not meant to be a serious adaptation. As you can see from the title, this movie is not about Sherlock Holmes, nor is it about the character’s actual brother from the books, Mycroft. 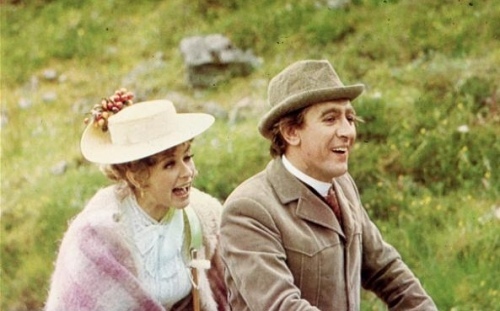 No, in this movie Gene Wilder is playing an entirely made up character named Sigerson Holmes, who basically is looked at as the “black sheep” of the Holmes household. In this movie, Sigerson means to show how much smarter he is than his brother by solving a case on his own, with some very disastrous results. Sherlock does appear in the movie, played by actor Douglas Wilmer, but he’s primarily a secondary character at best. This film is not meant to be a true adaptation of Doyle’s novels as it is obviously a parody, but still one that draws inspiration from the subject that it’s mocking. 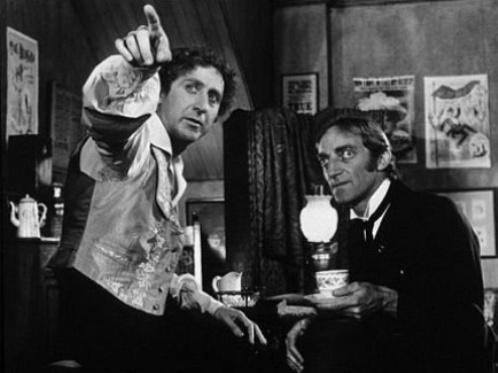 Wilder is typically zany here, and is well supported by other comedic actors like Madeline Kahn and Marty Feldman, but the movie doesn’t have the same comedic balance that say Young Frankenstein (1975), another parody film that Wilder headlined, had. Apparently this film was passion project for Wilder (he wrote and directed it as well), which kind of explains why the final product lacks focus. It’s interesting more as a parody of the archetypes of a Sherlock Holmes mystery than as story on it’s own. This film was the first serious production by a major studio for the classic character in many years, and even included the involvement of Steven Spielberg as a producer. Directed by Barry Levinson and written by future Harry Potter-helmer Chris Columbus, Young Sherlock Holmes takes us back to the detective’s youth, showing how he would become the man he was destined to be. With a young John Watson by his side (played by Alan Cox), teenage Sherlock uncovers a mystery surrounding a mysterious cult, which soon leads to some supernatural encounters. While the film is lavish and impressive, I couldn’t help but feel like there were some missed opportunities in the plotting of the story. One, the film doesn’t develop the characters of Sherlock and Watson much, and instead just paints them in broad strokes, showing that they’ve always been the way they are from the very beginning. Two, the film gets bogged down in it’s production values, choosing to indulge in spectacle, particularly towards the end. The thing that does work best in the film however is Nicholas Rowe’s performance as Sherlock. For the first time since Rathbone’s portrayal, we see the awkward social misfit whose genius comes out in unexpected ways in this version. Tonally, the film gets the character right and in that regard it succeeds as an interesting version of the character. It seems like an odd choice for Disney to translate the world of Sherlock Holmes into animation, given the original’s sometimes violent nature. Thankfully, they had the childrens’ books by author Eve Titus to draw from, which themselves were loving homages to Doyle’s original work. But, make no mistake. Even though they are portrayed as mice and the story is based around an entirely different character, this is still a Sherlock Holmes film at heart. 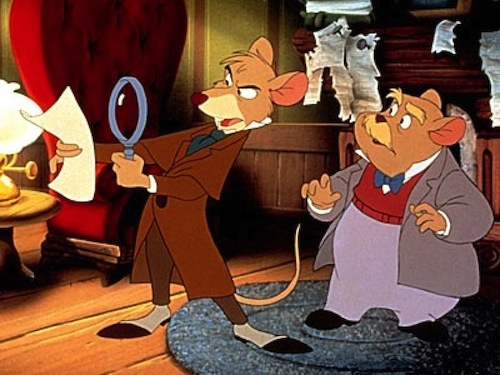 Following the adventures of Basil of Baker Street, The Great Mouse Detective is a sadly under-appreciated animated film, overshadowed by some of Disney’s more famous productions. It follows all the basics of a Holmes mystery perfectly and Basil is just as appealing as the famed detective itself. Despite the G-rating this film received, it is also surprisingly dark and frightening at times. Basil is voiced by Barrie Ingham, who does a great job of capturing that Rathone-inspired cadence in the character, bringing all the charm as well as all the narcissism and eccentricity that Holmes was famous for. The film also features the great Vincent Price in the role of the villainous Ratigan, in what is probably one of the best vocal performances in any Disney film. For many people in my generation, this movie was probably our introduction to the world of Sherlock Holmes, and it’s not an unworthy way to start out either. Also of note, Sherlock Holmes himself does appear in silhouette in some scenes, and his voice is supplied by non other than Basil Rathbone, through archive vocal tracks taken from the original movies. Sherlock Holmes has stayed in the public consciousness continuously over the years, but the films that brought him back to popularity in a big way recently were these two productions, both directed by Guy Ritchie. Riding high off the success of the Iron Man franchise, Robert Downey Jr. took on the famed character, this time bringing out more of the oddball aspects of the character. The Ritchie Sherlock Holmes films are by no means faithful adaptations of the classic novels, nor are they trying to be. These movies give us Sherlock Holmes, the action hero, and less of Sherlock Holmes, the super sleuth. But, with an actor as skilled and as charming as Downey, it’s a version of the character that is still worth watching. Despite the bombastic nature of Ritchie’s direction, the film does do a good job of portraying the character himself. 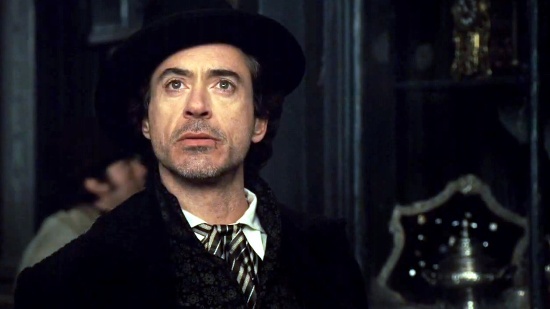 Holmes is once again the social misfit who can see the world differently from others, which Downey especially indulges in with hilarious flourish. Better yet is the portrayal of Dr. Watson in the movie, this time played by Jude Law. Watson, like Sherlock, has been beefed up into an action hero, which I think works better in Watson’s favor, showing him as more of an equal to Holmes than as his faithful helper. 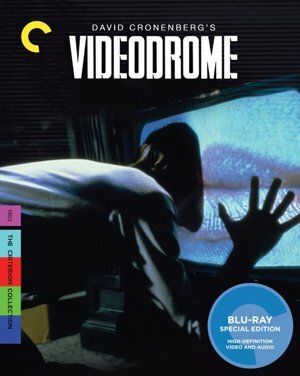 They may not be true to Doyle’s original vision, but these films are still enormously fun, and they especially do right by the characters, helping to modernize them for contemporary audiences. I may be cheating a bit by including this version of the character in this profile, considering that it comes from a TV series and not a movie. But given that each episode of this current BBC series is feature length, I feel that it deserves a place among it’s big screen peers. The Sherlock TV series took the risky direction of taking Arthur Conan Doyle’s classic stories and adapting them into a modern day setting. Remarkably, show creators Mark Gatiss and Steven Moffat have managed to make the setting work and it shows that Doyle was clearly ahead of his time as a writer. 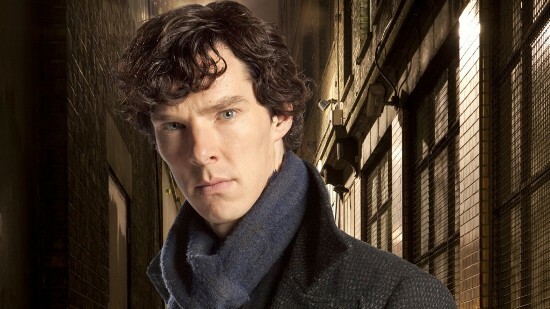 Probably the biggest reason for the shows success is the casting of Benedict Cumberbatch as Sherlock. The actor just feels custom made for the role, and he has come to own the part just as strongly as Basil Rathbone did many years ago. I particularly like the way that Sherlock tries hard to connect with people on a human level in the show, even though it annoys him when interferes with his methods; something that has never been explored effectively from the novels until now. Another great part of the show is the casting of Martin Freeman as Watson. 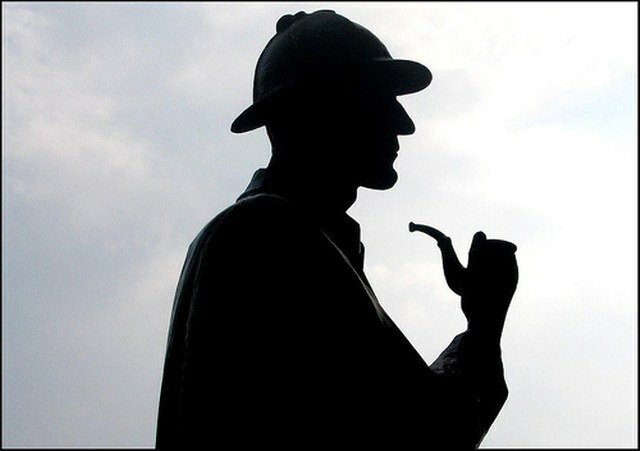 Like Jude Law’s version of the character, Freeman’s Watson is less of an observer and more of Sherlock’s other half; someone there to ground the detective into the real world. Cumberbatch and Freeman have unmatched onscreen chemistry, which I think has really been the reason for the show’s success. Thankfully, the series has become a huge success both in it’s native England and abroad, and it did it by staying true to it’s roots, while at the same time making it work for modern tastes. Few other characters have had the lasting legacy that Sherlock Holmes has had over the years, and the best thing about it is that it’s just getting stronger. Amazingly, Arthur Conan Doyle was never as proud of his Holmes novels as he was over his work in historical fiction. I’m sure what the author couldn’t see was the way that his hero would inspire many other characters over time. Though Sherlock’s talents were plausibly built over a lifetime of work, it nevertheless made him stand out as extraordinary to readers. I’m sure that comic book writers were inspired Sherlock’s extraordinary gifts when they created heroes of their own. While some had supernatural talents that far exceed anything that Holmes was capable of, they nevertheless follow the same example of making those talents work for the greater good and the ultimate truth. Likewise, the idea that any hero is susceptible to going the wrong way in life based on their decisions was also one that was explored in Doyle’s novels. You can see examples of equal but opposite villains in many comic book narratives throughout history, which harkens all the way back to the dynamics between Sherlock and his arch-nemesis James Moriarty. It’s a strong legacy that continues to get stronger and is reaching another high point today with the Guy Ritchie films and the BBC series (which ends it’s 3rd season here in America this weekend). Like the best characters in our cultural history, Sherlock Holmes will always be timeless and will continue to stand out as one of cinemas defining heroes.